We all loved this year’s Christmas card idea – partially because each of us contributed something to the overall design but mostly because we were all super excited to feature our newest family member, Suheila Peña, our exchange student from Mexico! Going into the shoot, we were pretty sure of ourselves. 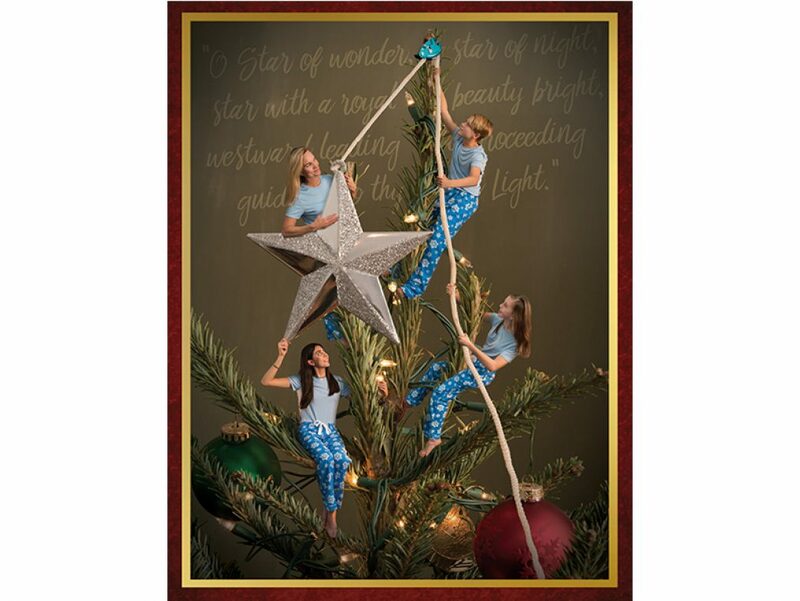 Shooting each person individually and then Photoshopping us onto the tree sounded like a breeze. We could work around everyone’s schedules and it wouldn’t take up an entire Saturday. Perfect! But the thing is, we are not perfect, we can’t pose like action figures. You see, Steve shot the tree with little G.I. Joe action figures positioned exactly where he wanted them. They were our body doubles. All we had to do was get into our action figure pose from head to toe to finger alignment, smile, look natural, pretend we were climbing and then hold that pose…indefinitely. Exasperated photographer: “None of my clients behave this way!” Photographer’s children and wife: “Well, surely you don’t treat your clients this way? !” Oh, and believe you me, there were moments when we said things like, “maybe we should just cancel the card this year? !” Gasp! “Maybe we should just take a picture in front of the Christmas tree? !” Gasp! “Maybe we should just take a picture of Murphy – he will cooperate!” Not the worst idea. We knew we had to remain civil and positive though. You see, we wanted to convince Suheila that being in an Exum family Christmas card is lots of fun and super cool. We weren’t fooling anyone. Just ask Kelsey or Alex. On second thought, don’t. We got through it though because the bigger picture (the one we had all agreed on!) was more important. I mean, we all wanted the same darn thing! Also, we didn’t want to let anyone down or abandon tradition, and we absolutely had to pull it together and make good on our promise to Suheila – this is her first Christmas in the states! So we dropped our egos and our individual ideas of “perfection.” We remembered our guiding light and we agreed to proceed and work together to hoist our star. May we all find common ground and work together to see the Light in the new year.